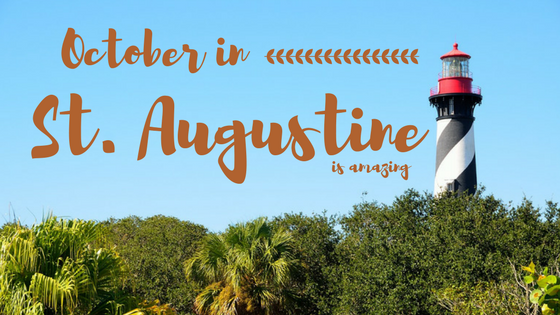 Nothing says pumpkin spice and everything nice in St. Augustine like cool Autumn months. To be completely honest fall weather in St. Augustine isn’t much different than summer weather; it’s just a tad cooler and the nights are fantastic!!!! Origins of Halloween and Haunted Pub Crawl – is available the month of October. If you are into finding ghosts and learning about the history of Halloween with a complimentary cocktail, than this tour is a must for you. The tour takes place in the historic district. You can learn more here. Corn Maze at Sykes and Cooper Farms – Whether you have kiddos or not, this event is pure good old fashion fun. This corn maze changes every year and offers clean honest fun for people of all ages. They have hayrides, viewing of farm animals and games like sack races! To find out more about this local favorite click here. St. Augustine Greek Festival- This festival lasts about a week and varies each year. If you like Greek food and everything Greek then this is a must for you. They have homemade Greek foods to try and items to purchase as well as traditional Greek music and dancing. I have found this festival to be a ton of fun! To see dates click here. Of course we have more events like the farmers market every Wednesday morning at the St. Augustine pier and various festivals that celebrate children, history, wine, etc. It really depends on what you are used to. Do you want to know what my favorite event of all is in October? Nightly walks on the beach at Beacher’s Lodge and listening to the peaceful sounds of Crescent Beach. The moon is full, the water is lapping on the beach creating a nighttime lullaby as the cool breeze whisks across your face and tickles your toes. Doesn’t that just sound amazing? Of course if you come visit St. Augustine in October you know there are plenty of tours, events and venues that have a ghost story or two; but you won’t hear of one here. If you are into strange occurrences or looking to be frightened download the ghost finder app on your phone and just walk around the historic district at night. You will either find it comical or frightening. Here’s another fun October tip that you will only hear about from a true local. As you know St. Augustine was primarily built by Henry Flagler. What was once the famous Flagler hotel is now home to many college students and is now called Flagler College. Go to the entrance of the college and in the foyer there to the left of the door you will see that one of the small tiles looks like it has an imprint of Mr. Flagler himself. Many thought it was a myth, but it is true! I have seen it with my own eyes. I hope to see many of your visit us in October so you too can enjoy fall in paradise. are there any places that I can take my little dog. Are motels pet friendly.? How bout eating places. Some of our suites are pet friendly. Paula Beachside Grill next door will allow you to dine outside with your pet. There are also a lot of areas to walk downtown or on the beach with your pet as well.